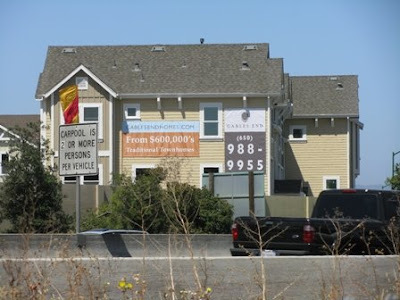 Driving home from Shoreline Golf Links I noticed the big banner along the 101 freeway advertising newly built Gables End townhouses. It looks I was speeding and read the complex name as Cables End instead of Gables End, because Google search for Cables End Mountain View returned no appropriate results. I tried different approach and tried to search for new townhouse development in Mountain View, but again there was no luck. I gave up and after my next golf game on Shoreline Golf Links I made a stop near the entrance to the Permanente Creek Trail and took a few pictures. 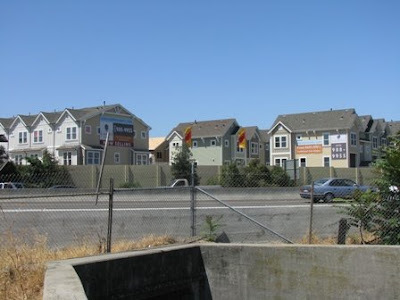 108 homes of Gables End Mountain View by Regis Homes priced from $595,000 to $725,000 and adjusted to highway 101. Monthly homeowner HOA fee is $197. I bet the future homeowners can see from windows sunrise over Googolplex, but in the same time you will hear the roar of cars on highway 101. Despite the proximity to highway 101, you should remember that Gables End is every commuter’s dream. It close to Caltrain’s bullet train stop, VTA’s light rail start here and there are four freeways 101, 280, 85 and 237 nearby. In the same time Mountain View has live downtown, while nearest Sunnyvale still trying to figure out downtown future, Santa Clara and Cupertino doesn’t have any. Mountain View is one of the greenest cities in United States and in addition it has free Google WiFi coverage even on newly completed Stevens Creek trail. There are huge selection of shops like Safeway, Mervyns, Ross Dress For Less, Trader Joe's, Sears, Wal-Mart and even Whole Food on San Antonio Shopping Center just in ten minutes drive from Gables End Mountain View. Based on the map of enrollment boundaries for Mountain View Whisman School District and Mountain View Los Altos Union High School district the kids from Gables End will attend Monta Loma Elementary, Crittenden Middle School and Los Altos High School. Only Crittenden Middle School is located within walking distance from Gables End Mountain View. The parents have to rely on district buses on use own means of transportation. The Cables End's sales office address is 1925 Cambridge Dr Mountain View. Any plans for sound wall between 101 and Gables End?